This classic horror film contained a visceral transformation scene (that won an Academy Award for Best Makeup for Rick Baker), the first to win in the newly-established Oscar category. It told how backpacking American college student/tourist in the Yorkshires David Kessler (David Naughton) turned into a werewolf/lycanthrope - his body, face, and limbs crunched and his skin bubbled as it grew hair and his body stretched out and was elongated. The transformation scenes were created entirely through a combination of prosthetics and robotics. The use of Go-Motion brought this film an Academy Award nomination for Best Achievement in Visual Effects, which it lost to Raiders of the Lost Ark (1981). This sword-'n'-sorcery film, a co-production of Walt Disney and Paramount, introduced the innovative technique of Go-Motion, a process created by Industrial Light & Magic (and Lucas animator Phil Tippett). It was a variation on the earlier technique of "stop-motion" animation (popularized by Willis O'Brien and Ray Harryhausen), by having the animated model (the Dragon) make several moves within a frame, thereby giving it a more fluid, blurry, and natural movement. By contrast, the traditional stop-motion technique was more jerky, static and wooden in appearance, as in Harryhausen's Clash of the Titans (1981) released in the same year. Joe Dante's horror/comedy The Howling (1981) featured stunning metamorphosis, shape-shifting sequences of man-into-wolf (one was juxtaposed with a TV scene of the Big Bad Wolf in The Three Little Pigs (1933)). The special groundbreaking makeup effects were originally to be produced by makeup wizard Rick Baker, but director Landis took him away to work on An American Werewolf in London (1981) (see above), so Baker's assistant Rob Bottin filled in - this was before the days of CGI. The visual effects in Michael Crichton's high-tech science-fiction thriller featured the first CGI human character, model Cindy (Susan Dey of The Partridge Family fame). In the story, Cindy stripped naked and allowed herself to have her body digitally scanned by the Digital Matrix research firm, to create a 3D computer-generated model of her entire figure. Her digitization was visualized by a computer-generated simulation of her body being topographically scanned - notably the first use of shaded 3D CGI in a feature film. Polygonal models obtained by digitizing a human body were used to render the effects. Part of the reason why this film won the Academy Award for Best Visual Effects was due to its awesome climax with amazing visual effects, revealing the power of the Ark of the Covenant as it was opened by the face-melting Nazis. This classic, noirish science-fiction film was nominated for Best Achievement in Visual Effects (as was the ghost-story Poltergeist (1982)), but both lost to E.T. the Extra-Terrestrial (1982). One of the most awe-inspiring visuals in film history, paying homage to Lang's Metropolis (1927), was the powerful vision of the Los Angeles cityscape at night, circa 2019, with giant, fire-belching towers, floating advertisements, giant television screens, and police "spinners" (flying cars). It was as if Los Angeles' sprawl was one giant oil refinery. The dark, futuristic vision of LA was accomplished using model shots and painted backgrounds. All images were based on the art design of legendary artist Syd Mead, who would collaborate with Jean 'Moebius' Giraud on TRON (1982) (see below). Dark Crystal was Jim Henson's darkest, most foreboding film, and the first film to completely use realistic puppets without a single real human or animal character. The film was composed entirely of puppets, matte paintings, and some miniature sets. The character and world designs were made by famed fantasy artist Brian Froud. This Steven Spielberg film was an Oscar winner for Best Visual Effects (defeating Poltergeist (1982) and Blade Runner (1982)). About $1.5 million of its $10 million budget was set aside for the creation of the E.T. alien, and another $1 million for other effects shots. It was famous for the flying bicycle scene in which the kids escaped into the air on their bicycles, and later the scene of the alien and Eliott illuminated in silhouette (using miniatures) against a giant-size full moon. As an experimental, art-house film, this feature-length documentary showcased innovative uses of time-lapse, slow-motion (and hyper-speed), and double-exposed (and super-imposed) photography. The animation of political cartoonist Gerard Scarfe was created for both Pink Floyd's multimedia concert and for the 95 minute Alan Parker film. There were 15 minutes of animation that appeared periodically during the film. It was one of the first truly adult animated work in terms of maturity - sexually and politically. One of the most indelible animated images was of marching hammers goose-steping across ruins. This sequel Star Trek release barely beat TRON (1982) to take the unofficial honor of being the first film to use computer-generated images (CGI) to any large extent, in its "Genesis Effect" sequence. The so-called "Genesis Effect" - a one-minute animated sequence, was cinema's first entirely computer-generated (CG) sequence. 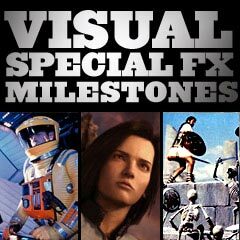 It marked the first cinematic use of a fractal-generated landscape, particle effects (a particle-rendering system was used to achieve the fiery effect), and 32-bit RGBA paint software created by Lucasfilm's Pixar group division at ILM. The computerized simulation was first seen in a video proposal or demonstration presented by Dr. Carol Marcus (Bibi Besch), in which the once-dead planet was struck by a Genesis 'torpedo' and reborn or revived, as the camera raced quickly across the reddish and then greening surface of the barren planet, before becoming a reborn globe. "It is a process whereby molecular structure is reorganized at the subatomic level into life-generating matter of equal mass...It is our intention to introduce the Genesis Device into a preselected area of a lifeless space body - a moon or other dead form. The device is delivered, instantaneously causing what we call the Genesis effect. Matter is reorganized with life-generating results. Instead of a dead moon, a living breathing planet capable of sustaining whatever life-forms we see fit to deposit on it...The reformed moon simulated here represents the merest fraction of the Genesis potential should the Federation wish to fund these experiments to their logical conclusion." The film also included the scene of Captain Spock's (Leonard Nimoy) self-sacrificial death to save the USS Enterprise from the Genesis Device explosion, with his ejection-burial in space to orbit around the newly-birthed planet caused by the Genesis Effect. Another special effect was the scene of the brain-munching earwigs, in which vengeful superhuman Khan (Ricardo Montalban) placed a parasitic, insanity-causing Ceti eel into the ears of Officer Chekov (Walter Koenig) and Captain Terrell (Paul Winfield). Steven Lisberger's fantasy inside-a-computer-video-game adventure/science-fiction film was one of the first films to be derived from the video-game craze. The greatest testament to this film's unique visual effects, soundtrack, costuming, art direction and set decoration was that none of it has ever been duplicated, and remains unique to this day. It was refused an Academy Awards nomination because the voters felt the film "cheated" by using computer animation. In reality, the process was an extremely arduous one for animators. Seven years later, James Cameron's The Abyss (1989) won the Best Visual Effects Oscar for the same kind of technology. TRON was the first live-action film to use computer-generated imagery (CGI) to any lengthy degree (about 20 minutes) - in this case, it created a full 3-D graphics world, in its most innovative sequence of the famed racing bike or Lightcycle sequence depicting computerized lightcycles in a high-speed race. The Lightcycle sequence used the artwork and vision of legendary artists Syd Mead and Jean 'Moebius' Giraud, and visual effects done with a combined effort by Triple I, MAGI/Synthavision, Robert Abel & Associates, and Digital Effects. The film also featured a soundtrack by Wendy (nee Walter) Carlos that melded synthesized music with the London Philharmonic's orchestral music. Maurice Sendak's children's book Where the Wild Things Are was the basis for Disney's experimental 35mm test footage, directed by John Lasseter (the future animator at Pixar). Another film adaptation (with live-action and animation) of the book was released in late 2009, directed by Spike Jonze.